Is This The Best Snow Blower For You? This premium 30 inch snow blower (Craftsman 88396) will easily handle 16 inches or more snow on a 3 car drive 150 feet long. Craftsman is offers a snow blower for every homeowner, from “good” models that are the least expensive on the market to a “premium” model that is larger than you tractor mounted snow thrower. I am giving this snow blower my “best value” rating for 30 inch snow blowers for 2014. The combination of features, durability and service and parts availability make this one of the best snow blowers on the market. As a homeowner with a large driveway this is a great choice. Tool-less drift cutters. These are easily stowed so your snow blower doesn’t take up so much room when parked in your garage. Poly skid shoes that don’t mark your new patio or stained driveway, yet are as tough as the steel shoes on other brands. Electric, 4-way chute control. I really like this feature and is one of the specific reasons this now blower got the best rating for 2014. One industrial grade thumb controller lets you put the snow exactly where you want it. This new design is better than any previous idea because the motors are located away from the snow. A big motor with electric start sized to get your job done quickly and efficiently. This snow blower by Craftsman is a premium snow thrower at a “value” price. Craftsman has put all the features you asked for on this size snow blower, yet they have kept the cost hundreds of dollars lower than other brands. What you can use this snow blower for: For paved and gravel surfaces, patios, sidewalks and walkways. It will do grass pathways and trails by raising the skid shoes up. It will handle all types of snow including heavy, wet blizzard snow. Because it has larger tires than most of the other snow throwers you can go out in the back yard and easily clean a spot off for your dogs or make a path out to the utility shed or milk barn. You can use this to clean your patio and deck and the poly skid shoes will not scratch the surface. This is the right snow blower if you have a stained concrete drive. This snow blower will easily handle 16 inch and deeper snow falls. It will handle deeper snow falls if you live in a snow belt. The six forward and two reverse speeds will let you go slow for the heavy stuff and faster for the lighter snows. The Electric 4-way Chute Control. Can You Trust It? The other critical component, the control switch comes from one of the most abusive environments known. This little 4-way switch that sits conveniently under your left thumb has been proven reliable in one of the most damaging applications around. A Skid-Steer Loader. Think about it, a skid steer works in all weather conditions. Hot, cold, rainy, sunshine. The temperature range is -40 degrees to over 120. The vibration, dust and other hazards are some of the worst around. These switches get hit with debris and usually a hand, leg or other body part when getting in and out of the machine. If you have ever worked around a construction site or farm you know how much abuse these switches take. I am confident you will have no problems with this new electric 4-way chute control. What you may not like: This snow blower is 30 inches wide and probably won’t fit through the side door of your garage. If you have to go through that side door to move snow make sure the door is at least 34 inches wide. Is This One Of The Best Rated Snow Blowers for 2013? That unit has been rated as one of the best snow throwers by other review magazines for 2011-2012. The drive system has been around for many years and is one of the most dependable transmissions around. The previous version without the new Just One Touch chute control has received 4.1 out of 5 stars with over 100 reviews. I expect this snow blower to get even better reviews because of the new electric chute. Does This Get a Best Snow Blower Rating For 2013? In the Good, Better, Best rating system this snow blower rates a “Best” for ease of use, durability and long life. Power Steering, electric chute, electric start, large engine all factor into this “best” rating. It uses a strong Craftsman motor that has plenty of power for it’s 30 inch size. In fact the motor is one of the most dependable on the market today. 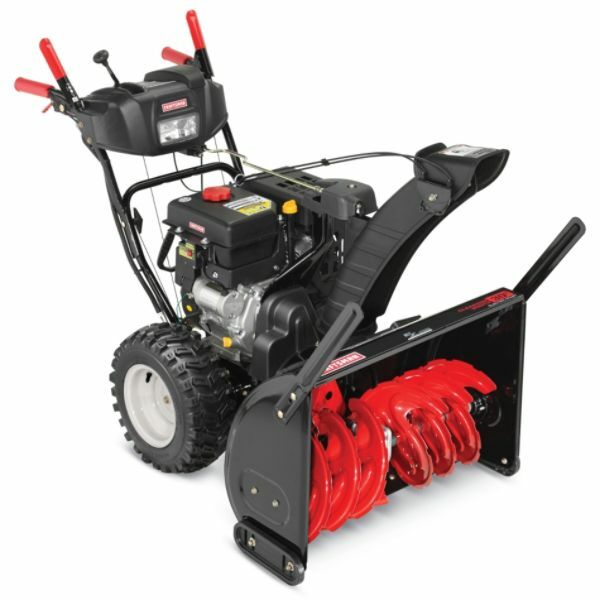 Don’t be afraid to buy this snow blower if it fits your needs. Is This One Of The Best Snow Blowers for the Money? I normally don’t give you my opinion, but if you need a larger snow blower this one ranks in my personal “top five” list. It is a great value for the size, has plenty of power to handle any snow, and “creature features” like the power steering and electric chute that makes this one of the easiest snow blowers to use. Customer Satisfaction: Only the electric chute control, LED Headlight and drift cutters are new. So the reviews you read of the 2012 models apply. The only negative reviews I read had to do with today’s fuels. You will see that everyone is happy with this snow thrower. It has plenty of power, capacity and throw distance, and that it has had virtually no mechanical issues. Value: At around $1229 it is a good value. If you have a smaller drive look at smaller snow blower. This snow blower is advertised as a premium snow blower at a value price and I have to agree. You get more “creature comfort” features for the money with this snow blower than most other brands. Service & Parts Availability: Service and parts are easily available through the store where you purchased it. On this size snow blower the one of the 10,000 Sears Service Techs comes to your house to repair the snow blower. You never have to transport it to a repair center. A 3 and 5 year protection plan is available from Sears that covers all defects, most wear and tear items, and fuel related issues at you home. No one else covers fuel issues. Ease Of Use: This is one of the easiest snow blowers to use because it has power steering and electric chute. It doesn’t matter if you are 5 ft, 100 lbs or 6 ft, 350 lbs you will be able to easily operate this snow blower. Yes, you can buy this one for your wife and she will enjoy using it. The power steering and electric chute make is a breeze to use. It is balanced well so you if you do have to lift up the front to go over an obstruction you easily can do it. Under normal snow removal conditions you will appreciate the traction this unit has. The electric chute control is intuitive and will put the snow exactly where you want it. Other features like good knobby tires, a headlight and electric start make this snow blower a much better choice than the economy models from other brands. Move more snow with a more powerful engine and save time out in the cold. This 30 in. Craftsman® Dual-Stage Snowblower has a 357cc* 4-cycle OHV engine, EZ Steer for better maneuverability and electric 4-way chute control.